I have been thinking about making Tofu soup lately and I came across this lovely soup recipe with cottage cheese from the book called Healthy Soups and Salad by Tarla Dalal. 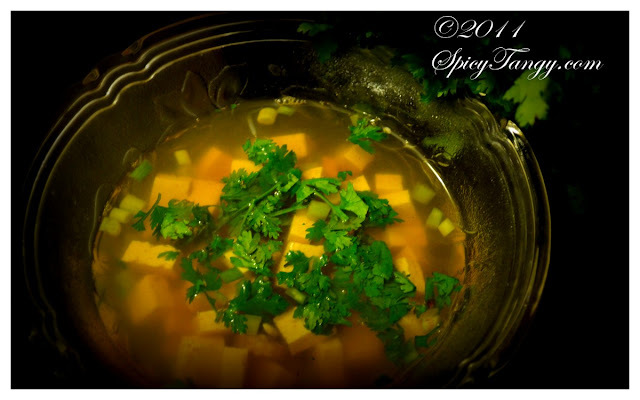 I got inspired from that and made this soup using tofu instead of cottage cheese :) Hope you all enjoy this recipe ! Add soya sauce, spring onions, sugar, white pepper powder and salt. Just before serving add the tofu and vinegar. Simmer for another 2 minutes. Hi dear. This soup looks good to drink.